Okay people, pop quiz! Don’t panic, this one’s easy. What do you do when you see a big bunch of overripe bananas on your kitchen counter? Anyone fancy a guess? Hmm? What’s that I hear? Make banana cake? YES! You are the smartest. 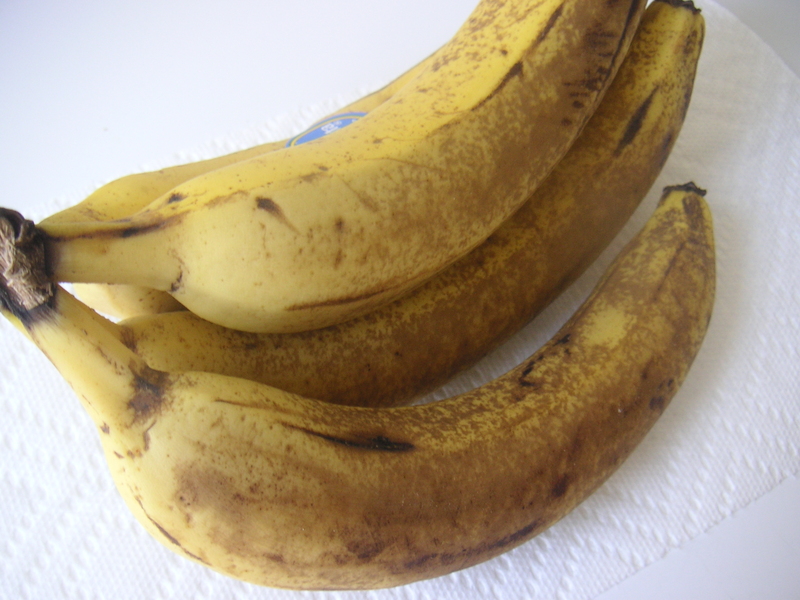 Now for the bonus question: What do you NOT do when you see a big bunch of overripe bananas on your kitchen counter? Anyone? Anyone? Bueller? Okay, I’ll tell you. You do NOT, under any circumstance, no matter what, underbake your banana cake. Just don’t do it. Because I did, and let me tell you, it’s awful. Awful! Just… so sad. There I was on a Wednesday night, happily baking away in my little apartment kitchen, my ipod set to a playlist full of Marvin Gaye, Etta James and Alicia Keys, my mind thoroughly focused on the new banana cake recipe my coworker, Karthi, had recently shared with me. After a little spooning, measuring and mixing, plus a homemade rendition of “I heard it through the grapevine,” my kitchen began to smell sweet with banana and cinnamon – just how a kitchen ought to smell on a chilly evening in March, if you want to know the truth. That’s when everything went wrong. I peeked in the oven and saw that it was good and brown, so I took out my cake and let it cool before inverting the thing onto a plate. It looked light and springy, and slipped easily out of the pan. Success! Ahem…false. Apparently I was working with some pretty crafty banana cake, because despite its deliciously brown, moist and springy disguise, one slice revealed the shattering truth: light and springy this cake was not. It was… (gasp)… raw! Full of wet, gooey, raw batter. Yuck. I should have seen this coming. I should have done the toothpick test. How could I have skipped the toothpick test?! I spooned, I measured, I mixed! And all it got me was a soggy, messy excuse for a banana cake. I ate a piece, because, what a waste! But I was so disheartened I just threw the whole thing out. Somewhere, Al Gore is frowning at me. I’m sorry, Al! Blame it on the toothpick (or lack thereof). Whatever, banana cake. I call a rematch. And this time, I will eat you for breakfast. To be fair, Karthi’s recipe involved muffins. Fully baked ones. Karthi is a smart person, and I suggest you stick with her and leave the bundt pan at home. The batter from this recipe is quite delicate, as it contains no oil or butter, and it’s decidedly better suited for small, light muffins instead of a large cake. 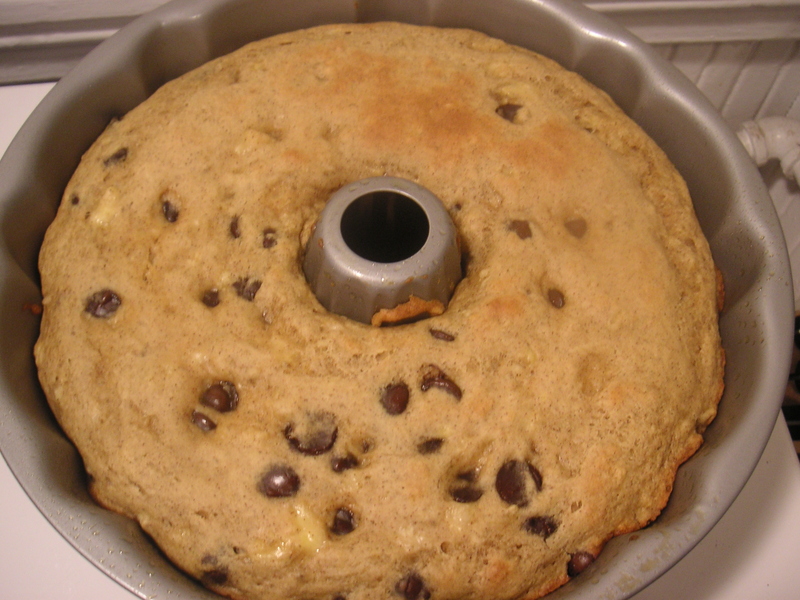 Properly baked, this batter becomes light and springy, with pockets of soft banana and chocolaty chips. Preheat the oven to 350 degrees. Grease two 3 x 4 muffin pans (or use muffin liners). Mash up the bananas in a bowl with a fork, and add the egg, yogurt, vanilla and sugar, mixing to combine. In a separate bowl, sift together the flour, salt, baking powder, baking soda and cinnamon. Slowly add the dry ingredients to the wet, mixing to combine. Add the chocolate chips. Pour the batter into muffin tins, and place the tins in the oven. Bake for 15-30 minutes, until a toothpick inserted into the muffins comes out clean. Try not to forget this last step, if you can help it. Note: Though these are wonderful as-is, if you’re looking to doll the little guys up, add some pecans to the batter, and top them with cream cheese frosting, a plain sugar glaze, or a simple dusting of confectioner’s sugar. Your picture looks like a big plate of chocolatey banana deliciousness thought, I hope you at least got some decent taste-tests! ps – your site is great! I just subscribed in email and cant wait to try some of your recipes! Well, there are few things better than banana cake for breakfast. So I’m very much looking forward to the rematch. M- i love your blog- I am completely addicted…try sour cream in the muffins, i promise you they will be even more delicious!